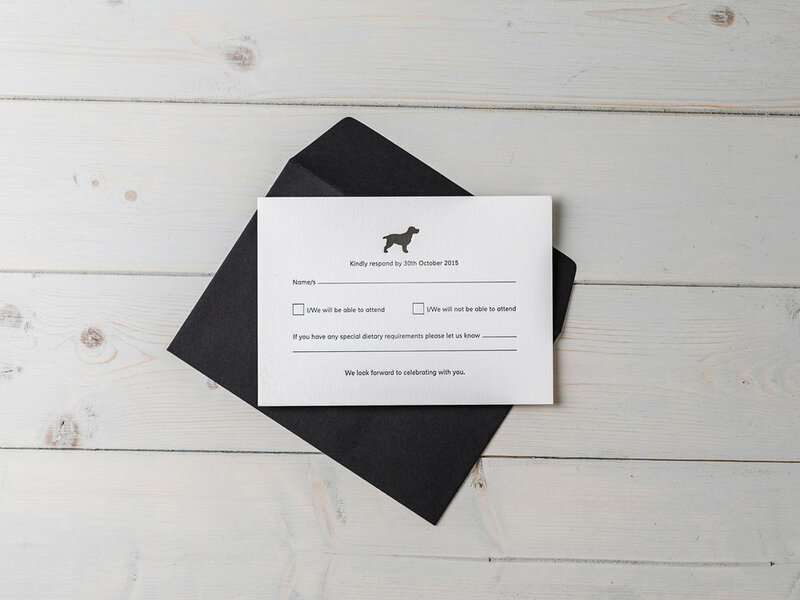 A collection of our Bespoke wedding stationery design that have been inspired by animals - much loved pets or even just favourite animals, this is a theme we love, so if you have a donkey you are desperate to put on some stationery please get in touch! An Art Deco inspired design, to reflect the wedding venue, with a completely unique twist a dinosaur motif! These dinosaur lovers wanted their invitations to really reflect them & have a completely unique design. An elegant train theme for a magnificent venue - St Pancras Renaissance Hotel. A stunning bespoke pocketfold design with a sage green and grey colour scheme and highlights of antique gold, perfect for a spring wedding. A traditional monogram wedding invitation set to include a range of invitations that could be personalised for each guests pocketfold bundle. 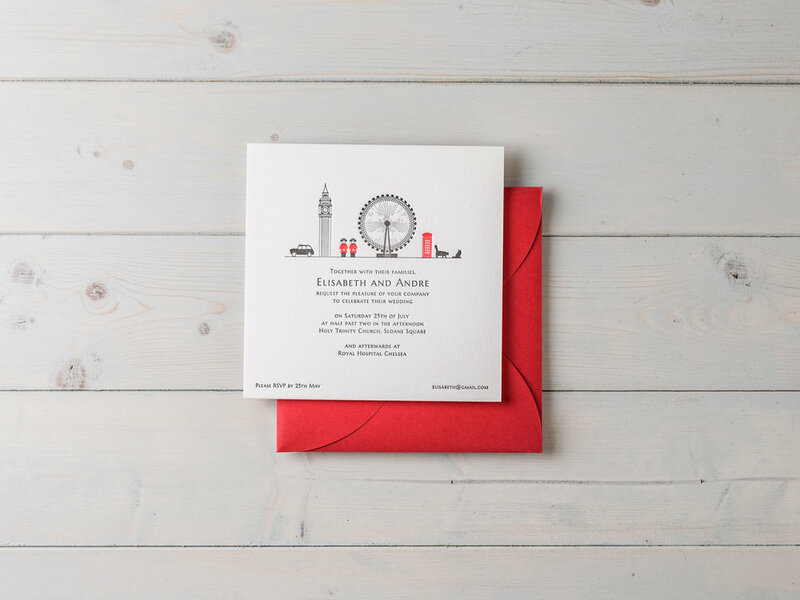 With a wedding venue of the Royal Hospital Chelsea, a brief to use London symbols & to include the couples pet cats, this wedding invitation set is really fun and unusual. The London themed motif is printed in two colours and includes some really fun details, the cats, a couple of Chelsea Pensioners & a red telephone box. A Modern Classic invitation combining contemporary layout format and patterned back with more traditional elements of the script font all tied in a wax sealed bundle. Bespoke Wedding Stationery designs inspired by couples nationalities and national symbols, printed by Letterpress. A pair of co-ordinating Wedding Invitation Suites designed around two different cities on either side of the Atlantic, London UK & Philadelphia, USA. A gorgeous contemporary design with art-deco details. A chic Wedding Invitation set with a pinch of whimsy. A beautiful French Chateau set the scene for a weekend of wedding celebrations and provided the inspiration for this Bespoke Letterpress Wedding Invitation suite. Including Save The Dates, Invitations, Menus, Tags & Orders of Service. A winter wedding from a gorgeous family home with much loved Cocker Spaniel to feature - A perfect brief for a Letterpress Wedding Invitation Set. A beautiful chapel wedding venue & love of books provided the inspiration for this wedding invitations suite. 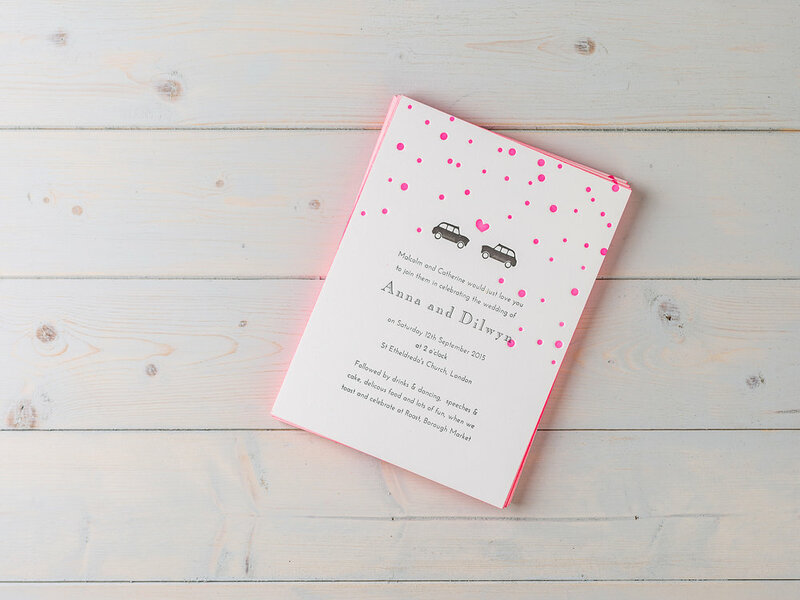 Featuring a bespoke map of the couples neighbourhood and the story of the place. Bespoke Wedding Stationery for a Gay Wedding at London's beautiful landmark Tower Bridge. A stunning masculine & fun design for a relaxed informal wedding. The London skyline design has a contemporary style that works beautifully with Letterpress printing techniques to create a striking wedding invitation set with deep textured print. The grey and navy colour scheme creates a masculine edge and bright orange symbols to tell the story of the big day - a fun party! 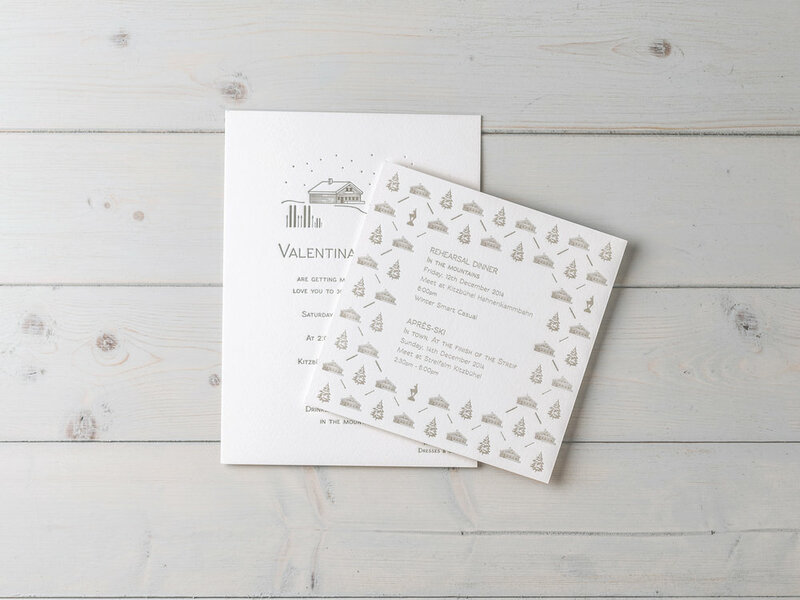 A bespoke wedding invitation set, inspired by Austrian Alps, a mountain top chalet reception and a young family.